Zhining sings with the Boston Beijing Opera Association, and last night was their annual performance. I had planned to go see a former student’s play, but Zhining presented me with tickets as a gift, and I just couldn’t say no to her. 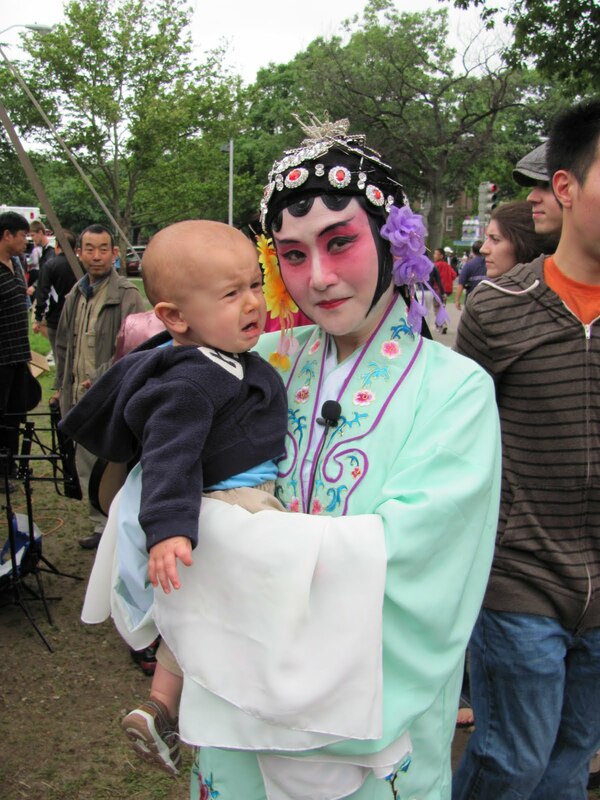 She was so excited that we were finally going to come see her (we also saw her perform at the Dragonboat Festival in the spring, and Robbie burst into tears when she held him in full costume, as pictured). Justin and I made a night out of it, with the help of Micah and Allie who watched Robbie for us. We took the T down to Central Square and ate at an Ethiopian restaurant we like. It was so nice to sit, relaxed, at a restaurant. Of course, the people with the three extremely loud children didn’t add much to the ambiance. Especially when the mother busted out the Obama picture book and opened with “What does Obama say?” and then proceeded to loudly talk about how “Obama is in charge of everybody in the United States.” I thought Justin was going to die! And then it was off to the Chinese opera. Justin and I weren’t quite sure what to expect, and we found the sixteen acts in the program a little daunting. But, they opened with a drum corps performing the Chinese Opera Overture, which was incredible. Zhining was amazing. And the 75-year-old woman who sang two numbers? She gave me chills. The orchestra that performed two numbers? Incredible.